Today's guest writer is D. L. Jung. He is the author of the YA novel, Sparrow Squadron. It is an adventure novel set in WWII. In this guest post, Mr. Jung gives us six examples of little known women who are warrior women and how they inspire today's fiction. I hope this enlightening guest post, and learn about some incredible women. I hope it also interests you to pick his young adult novel. Thank you, Mr. Jung! When we think of women warriors in fiction, there's a tendency to focus on fantasy or science-fiction. The archetype is Wonder Woman, born an Amazon princess and now a superhero in the world at large. But real-life women through the ages have taken up arms and fought with and alongside men. Even the mythical Amazons had basis in reality. Many of their stories have been overlooked or deliberately suppressed. Now more and more historic research is bringing them to light. There are frequent examples of noblewomen becoming warriors to defend their families in times of need. These women stepped in when their husbands, fathers, brothers or sons faltered. Women of humbler backgrounds have also entered combat, whether out of desperation, duty or sense of adventure. Here are six examples of women overcoming long odds to forge their legends as warriors, and the modern stories they inspired. Noblewomen training for battle was not uncommon in medieval Japan. This was necessary to defend the household during the period's brutal civil wars. Tomoe was notable for taking her skills to the battlefield in service of the warlord Minamoto Yoshinaka. Research seems unclear as to whether she was his servant, concubine, or wife. In any case, she was celebrated for her skill with many weapons and taking the heads of her enemies. She earned praise for embodying the ideals of samurai loyalty. The legend goes that when Minamoto fell in battle, only his direct order prevented her from fighting to the death with him. Fiction inspired: Tomoe Gozen by Jessica Amanda Salmonson is a historical fantasy take on Tomoe's story. With its freewheeling spirit and flouting of social norms, piracy often had a place for women to fight. Both Anne Bonny and Mary Read came from poor backgrounds. Bonny married a pirate. 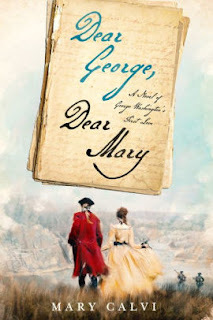 Read fought with the British Army disguised as a man before sailing off to the Caribbean. They fell in with "Calico" Jack Rackham's pirate crew. That started a successful run of raiding, in the course of which they earned the respect of the crew. By some accounts, they fought better than the men. The run came to an end when they were captured. They were spared the death penalty on the discovery that both were pregnant. Fiction inspired: Pirates! by Celia Rees is a YA novel whose two main characters were inspired by this pair. Originally born among the Ashanti people in modern-day Ghana, Nanny was kidnapped by slave traders. She was sent to work on a sugar plantation in Jamaica. She managed to escape these horrific conditions, then fought back. She joined with other escaped slaves, known as the Maroons, who continued a guerilla struggle against the British rulers of Jamaica. Despite attempts to eradicate her band, Nanny was credited with freeing more than a thousand slaves and established a fortified free town, Nanny Town. Eventually, Nanny Town's autonomy was recognized by the British and she remains a national hero in Jamaica. Fiction inspired: Abeng by Michelle Cliff features a descendant of Queen Nanny, and folklore built around Nanny figures prominently. Born in poverty, Cheng Shih was a prostitute who was captured by pirates. She managed to turn captivity to her advantage, ending up married to a pirate warlord. After his death, she seized control of his fleet. With this force, she raided the China Sea, taking on the Qing Emperor and European traders alike, building a small empire. She was never truly defeated but took an amnesty when it was offered and, amazingly, lived on to a peaceful end. Fiction inspired: “The Widow Ching, Lady Pirate” is a short story by Jorge Luis Borges based on Cheng's life. Lozen was a warrior also said to have powers of prophecy. When the United States tried to force the Apache onto reservations with terrible living conditions, many escaped and resisted. Lozen's brother, a chief, was one of the resistance leaders and Lozen joined him. Together they fought a running battle with American forces in modern-day Arizona and New Mexico. Lozen was active in combat and her brother even acknowledged her as the mastermind of the group. When a young woman travelling with the band had a newborn baby, Lozen added to her legend by singlehandely sneaking mother and child past pursuing American troops to safety. After her brother's death, Lozen fought on with Geronimo. They were eventually forced to surrender and Lozen died tragically on a reservation. Fiction inspired: Ghost Warrior by Lucia St. Clair-Robson is a historical novel based on Lozen's life. "There was a time when flying didn't mean looking over my shoulder for death coming at me." World War II. June 1941. Hitler's war machine turns to the Soviet Union. Escaping her hometown ahead of the Nazis, 16-year-old Aelya Makarova seizes a chance to live her dream. Obsessed with flying, she joins a women's fighter squadron to defend her homeland against the invaders. She'll go faster and higher than she's ever gone before. But the harsh reality of Air Force life shatters her expectations and forces her to grow up fast. The squadron is split by petty rivalries, male pilots treat them like a joke, and the ideal country she thought she was fighting for doesn't really exist. Finally given a chance to prove herself in battle, Aelya is pushed to breaking point. With all her talent, the help of her comrades, and a lot of luck, she might just make it through. But will there be anything left of her humanity? 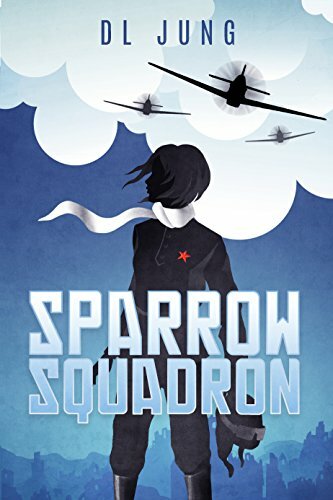 With fast-paced action and a heart-rending mix of humour and tragedy, Sparrow Squadron is an adventure novel for young adults that brings an overlooked episode of history to life. D. L. Jung is married, with two children, and lives in Toronto, Canada. They are lucky enough to spend part of the time in New Zealand. Outside of writing, he has tried stints as an industrial engineer, a film and TV script supervisor, an IT consultant, a professional game show contestant, and a grossly under-qualified business wear model. His first novel, Sparrow Squadron, is a YA historical action-adventure based on the true story of female fighter pilots flying in combat for the Soviet Union during World War II. It's available now in e-book and paperback. For more information, please visit his website. Thanks so much for letting me post here! I had a lot of fun writing this one. 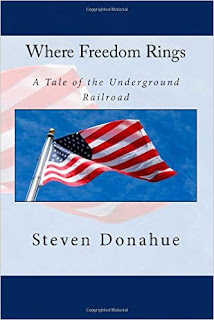 Synopsis: The thrilling story of four slaves who try to escape to the northern area of the United States along the Underground Railroad in 1853. Kelsa Colver leads her husband and two young sons on the dangerous trek after a fellow slave is murdered by a vindictive slave owner. Along the way, the Colvers are assisted by various abolitionists, including a neighboring farmer, a progressive priest, a sympathetic lawman, and notable figures Harriet Tubman and William Still. However, their efforts are impeded by a dark family secret, and the interventions of a corrupt clergyman, vicious outlaws and greedy slave hunters.